Research indicates that the speed with which a drug of abuse enters and leaves the brain affects how “high” it makes users feel. “Highs” tend to be more intense when a drug abruptly floods the brain and then rapidly washes out. This observation is important because the intensity of the “high” influences how much users will want to repeat the experience—hence, how addictive the drug is. Accordingly, “fast-in, fast-out” drugs tend to be more addictive. Cocaine is a highly addictive drug. This animation shows the rapid passage of the drug through the brain. It demonstrates that the intensity of the cocaine “high” parallels the trajectory of cocaine levels in the brain. Volunteers who had never used cocaine before were injected with the drug and were asked to rate their ensuing “high” at frequent intervals. Meanwhile, using positron emission tomography (PET) imaging, the researchers tracked the passage of cocaine through the brain. NIDA. "Animation: The Rise and Fall of the Cocaine High." National Institute on Drug Abuse, 7 Nov. 2014, https://www.drugabuse.gov/news-events/nida-notes/2014/11/animation-rise-fall-cocaine-high. NIDA. Animation: The Rise and Fall of the Cocaine High. National Institute on Drug Abuse website. 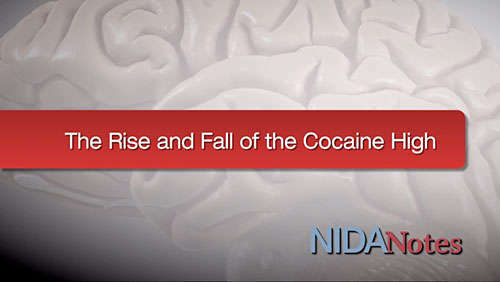 https://www.drugabuse.gov/news-events/nida-notes/2014/11/animation-rise-fall-cocaine-high. November 7, 2014.